See these sites for different and original text. A group of peasants uncovered some pottery while trying to dig a well near the royal tomb in 1974. It caught the attention of the world at large immediately. 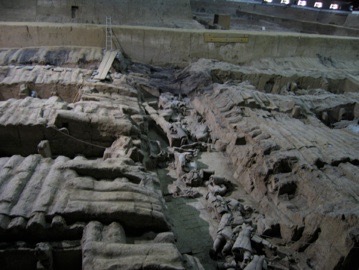 Archeologists came to Xian to study and to extend the digs. 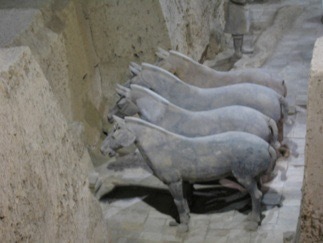 They established beyond doubt that these artefacts were associated with the Qin Dynasty (211-206 BC). 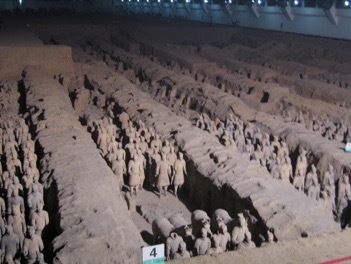 Upon ascending the throne at the age of 13 (in 246 BC), Qin Shi Huang, later the first Emperor of all China, had begun to work for his mausoleum. It took 11 years to finish. 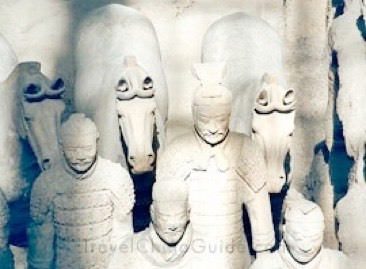 It is speculated that many buried treasures and sacrificial objects had accompanied the emperor in his after life. Qin was the military success that united the country, introduced a bureaucracy free of nepotism and settled things down with Xi’an (Chang’an then) as its capital. The museum site, begun in 1975 and opened in 1994, comprises three pits (1, 2 ad 3, surprisingly) plus museum displays and shopping mall (thankfully, outside the gates). The mausoleum is not yet open. The number of warriors discovered has steadily risen to its current 7000 or so. 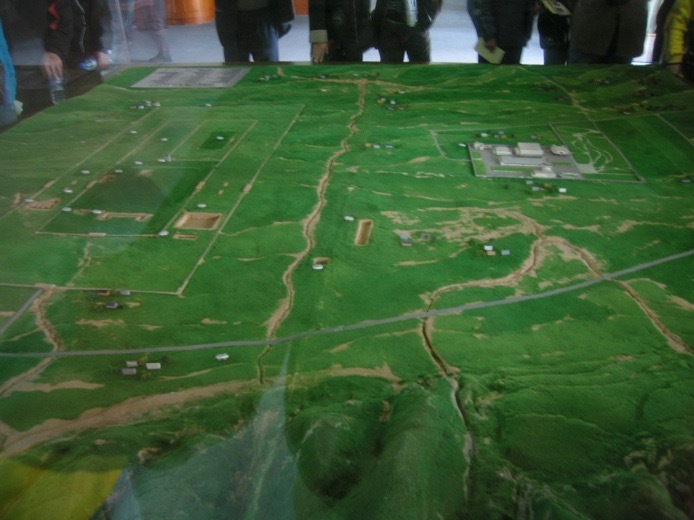 The area of the mausoleum and its associated warriors is much larger than the 1.6ha of museum site, being more like 20sq km. The warriors are individual and it is easy to believe that they are modelled on the soldiers of the time. Their faces are very different; so are their heights, build, stance and colour, some of which is demonstrated by these photos taken by my friend Jill from Suzhou. The effect that Pit 1 has is not unlike the first glimpse of the Eden Project – gobsmacking, even when expected. Below right in green is a photo of the site plan showing the grand design. You can see the museum upper right; the river, mountains and burial mound. The small pits dug elsewhere on the site show the restraint exhibited: westerners would have stripped the whole site. The original pit had a timber roof and some two metres of soil on top. At some later date revolutionaries in need of weapons raided the tomb. The tomb caught fire and the roof subsequently collapsed, breaking most things and leaving the biggest jigsaw puzzle in the world, whatever Guinness Records say. 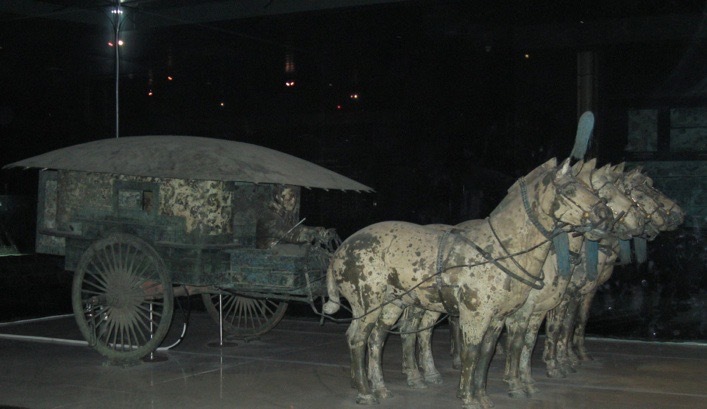 In the museum there are two carriages built half-size from nearer the mausoleum itself. There is no explanation offered why the perspective changes from the outside of the site towards the mound itself, but it seems that the base levels of the models fall steadily from five metres to eight and the scale reduces in some similar manner. The soldiers are laid out in a formation that might parallel an order of battle or a battalion inspection. 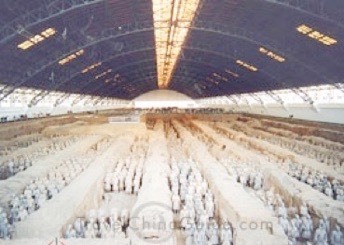 So Pit One is massed ranks with skirmishers on the outside, Pit 3 has what might be general headquarters staff. Wooden material has long rotted away. Large areas have been left for future excavation, not least in the hope that paint samples can be recovered – they oxidise very quickly on exposure, apparently. Some of the work is done in the hope of not needing to expose any new pottery. The mausoleum is not yet open the public but Qin's mausoleum is said by legend to contain rivers and seas of mercury surrounding his bronze crypt, all forming a model of the empire. 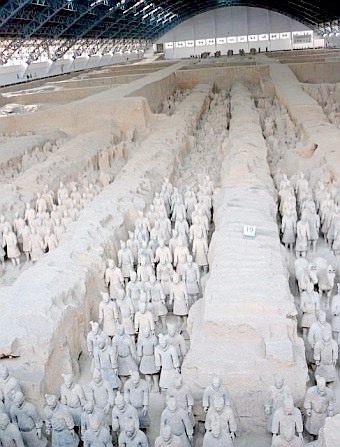 The vast army of individually sculptured terra-cotta soldiers is laid out in the military formations that proved so successful in battle. More recent excavations have unearthed re-creations of the dancers, musicians, and acrobats who provided the otherwise militaristic veneer of the Qin regime with a cultural refinement that would increasingly dominate succeeding dynasties. Descriptions by on-site Western & Chinese archaeologists, accompanied by exceptional graphic reproductions of the tomb [not yet found; these may be accessible outside China], describe an enormous necropolis with embedded jewels in its ceiling, a water clock, and the flowing mercury that recent archaeological probes into the structure have detected in large concentrations. Exquisite weaponry excavated intact from the burial site undoubtedly contributed to Qin's military conquests along with intense loyalty to the emperor. 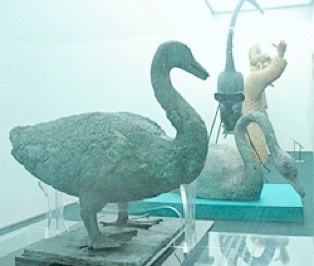 Most of this text and the waterfowl pic taken from http://www.archaeology.org/online/reviews/qin/index.html. Comments and suggestions for extension welcomed. 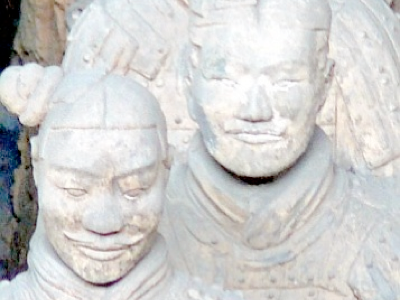 Facts not checked (no wikipedia access yet): was this Qin the first of his dynasty? When was the tomb damaged - which dynastic change? geoscientist/features/page7352.html in which John strongly suggests that the damage to the Warriors was from earthquake, not from rampage as we have been repeatedly told. His argument is convincing. Read also the next page, which event (not my writing) was what set John to thinking. Much of what is China proper was unified in 221BC. In that year, the most aggressive of the Warring States, subjugated the last of its rival states. Qin (formally known as Ch'in, from the English word China probably derived). 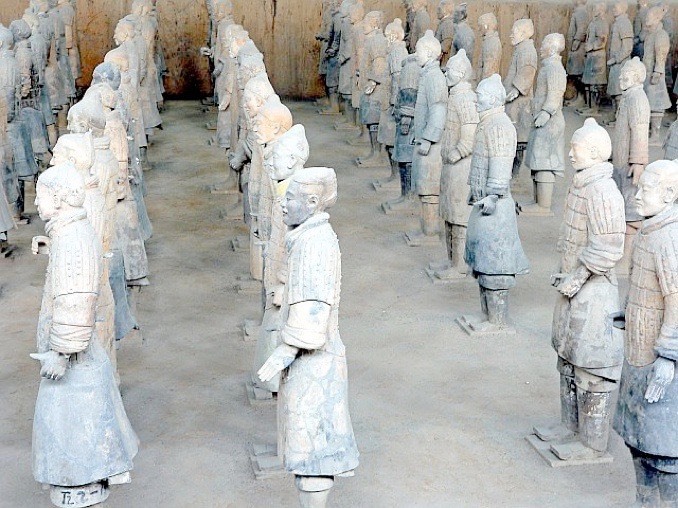 In subjugating the six other major states of Eastern Zhou, the Qin kings had relied heavily on standardising legal codes and bureaucratic procedures. To silence criticism of imperial rule, the kings banished or put to death many dissenting Confucian scholars and confiscated and burned their books. 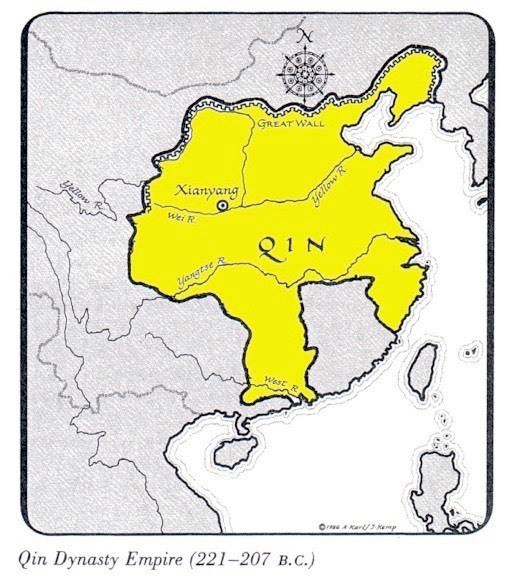 Qin aggrandisement was aided by frequent military expeditions pushing out the frontiers in the north and south. To fend off barbarian intrusion, the fortification walls built by various Warring States were connected to make a 5,000-kilometre Great Wall. The Great Wall is actually four great walls rebuilt or extended during the Western Han, Sui, Jin and Ming periods. A number of public works projects were also undertaken to consolidate and strengthen imperial rule. These activities required enormous levies of manpower and resources, not to mention repressive measures. Revolts broke out as soon as the first Qin emperor died in 210 BC. The dynasty was extinguished less than twenty years after its triumph but the imperial system initiated set the pattern for the next two millennia.